Things are moving on fairly well this season. The polytunnel has made a huge difference to my growing here. My only regret is not going for one some years back. 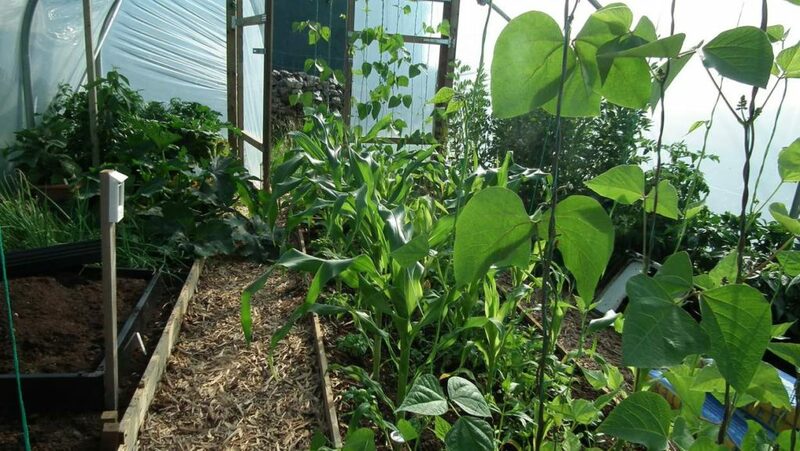 The sweetcorn is shooting up now and the runner beans are up to the cropbars. They’ll need pinching out next. Broad bean pods are filling, bush plum Roma tomatoes growing like triffids, some sweet peppers near ready to start harvesting and I’ve never had a courgette plant as large as the one in there. 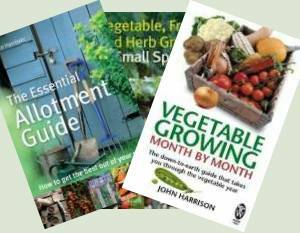 The broad beans are remarkable – they’re literally about 5 feet tall. Over double the height of their counterparts planted outside which are looking pretty battered still from the last storm we had. 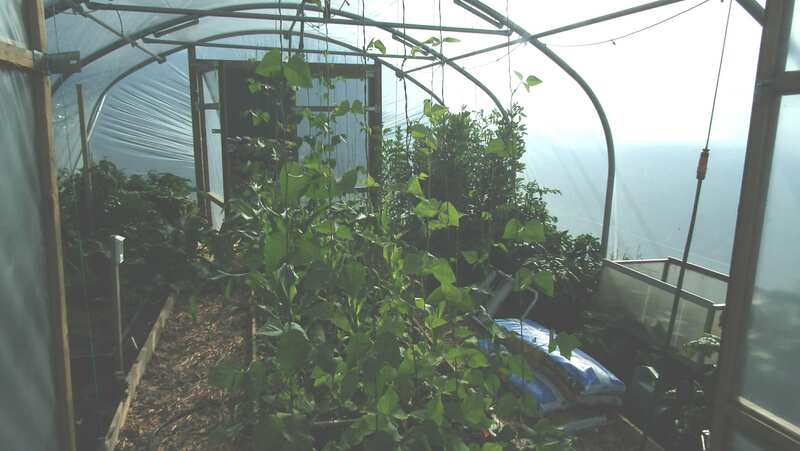 Mist spray cools down the polytunnel when the temperature hits furnace. 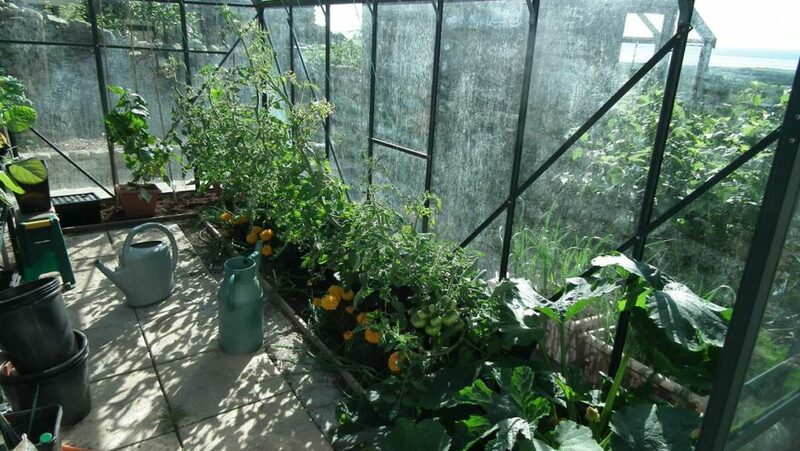 Over in the greenhouse the tomatoes seem to have slowed a little, possibly due to the hot weather? I’ve added more ‘chill out’ to the water and hope it does the trick. 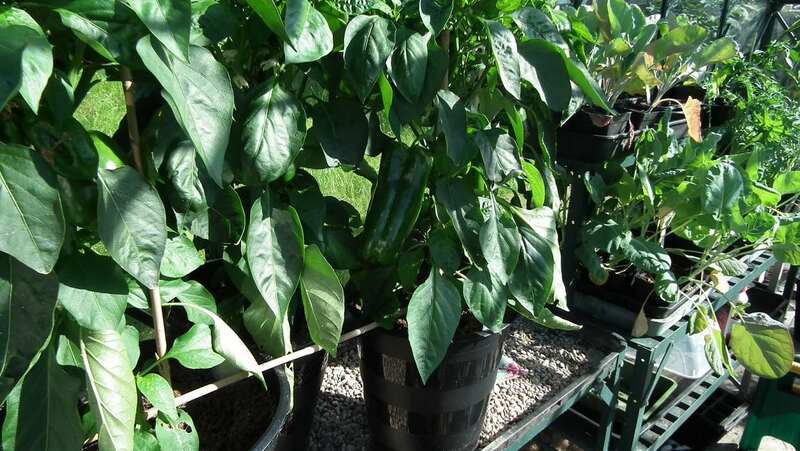 The peppers in here are doing well and one in particular is huge. The variety being Jumbo I suppose I shouldn’t be surprised. I’ve a courgette in the border which is pretty big but behind the one in the polytunnel. The cucumbers are doing well and the milk sprays seem to have arrested the powdery mildew. Problem; the blind cat that likes eating cucumber leaves now thinks they’re being served in a sauce! 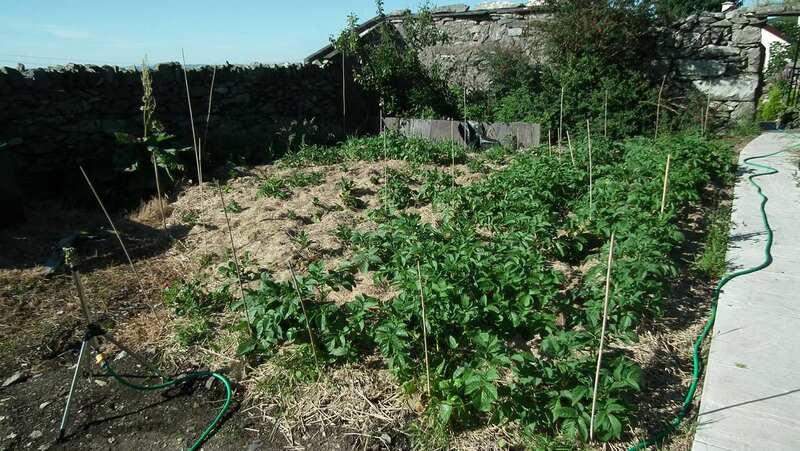 The potatoes under straw look to be up or pushing through nicely. I heard an interesting fact about potatoes on the radio a few weeks back. Until the introduction of the potato from the Americas, Europe was subject to frequent famines with all the social disruption that caused. After potatoes started to be grown, these famines stopped allowing for development and the industrial revolution as less people were required for food production. 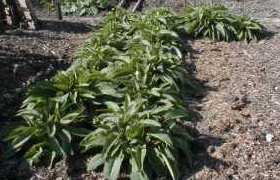 Potatoes are such a productive crop and the potato so nutritious that they can replace cereal crops. Yet one man can grow enough to feed his family unlike cereals that after growing and harvesting still need threshing, winnowing and grinding to produce flour before you even start to make a meal. Surprising what you learn just by listening. 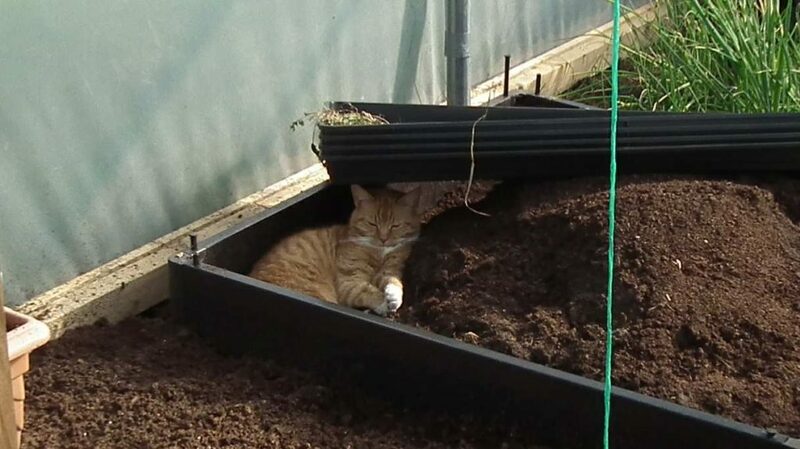 It’s lovely and warm in the tunnel but it can be too hot in direct light so our cat Willow has found a nice shady spot under some trays on the raised bed that the spuds came from. It’s a hard life for some. 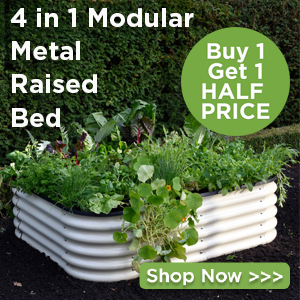 ‹ Organic Hydroponics – Is it possible?